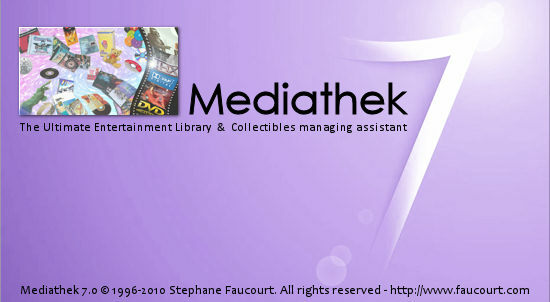 Mediathek 7.1 is available for download since august, 12th 2011. You will find here below the list of major new features accessible to the end-user. Feel free to use the suggestion form to submit comments, improvement and enhancement requests, based on your own using experience and needs. Mediathek is declined in two licensing modes with a unique distribution : a no time-limited freeware release with major functionnalities and a shareware release with the whole software including advanced features. New item - pre-set values using main caracteristics from current selection. Dynamic list on Country field in New/Edit window. Reference field forced recalculation on current selection. Direct access to pictures association with current selection from context menu. File/Folder scan: create a link to scanned file with imported entry. Mediathek 6.x Import: finalize import by auto-grouping fields with a Mediathek 6 sorting style + line feed fixed. Bug: Document view refresh upon item deletion from context menu link. Bug: Display and ressource consumption fix after adding 30-40 entries. Select following entry after item deletion (avoid going back to top of document). Mediathek 6.x legacy Windows shell file associations. Software updates verification procedure enhancement. Native XML settings and document file format. Windows XP, Vista, Windows 7, 32bit + 64-bit support. Mediathek 6.x legacy file support. Enhancement picture support (Jpeg, Gif, Png file formats) and display. Interface simplification, Office-like ribbons, toolbars customization. Filter bar with multi-criteria search support and found occurrences counter. Revised simplified management for default categories, links and borrowers. Full customization support for fields labels/headers and default values. New Reference field with alphanumeric format support and automatic increment when adding items. Enhancements for barcode reading devices support. Multiple selection, features and menu commands applied only on selected items. Enhanced numeric sequence analysis for copy/paster/move automatic renaming features. Improved Internet accesses and requests. Document view WYSIWYG Printing mode, print settings customization, variables support for page headers and footers. Windows Quick-tray notification on late for return items. Automatic lending status report on day change. Possibility to set borrowers list order in context menus. Mail features enhancements, support for pre-recorded message body in raw text or HTML format. Native MAPI mail support = no more security warnings + full compatibility with Enterprise emailing systems. Complete revision of import / export system, and simplified options. Exports achieved on the active document view (allow to export the full document content or active/filtered selection). New Internet import filter that requests websites with HTTP and XML support (depending on site). Automatic Import filter starts upon CD or removal media insertion.